Review: The Case of The Mysterious Countdown is another marvelous, fascinating, and extremely brain catching Whiz Tanner mystery. The Case of The Mysterious Countdown by Fred Rexroad is an action packed suspenseful story for people who enjoy an explosive ending. The Tanner Dent Detective Agency is on the case to stop The Case of The Mysterious Countdown and paste their faces on the front page of the Jasper Springs Newspaper again. This book is an adventurous page turner that will take you through the journey of how two brave middle school kids crack a mystery wide open. It is an unforgettably slow summer for the Tanner Dent Detective Agency when Whiz Tanner gets a phone call from his uncle in New York City who is reporting a library book he has found, but the problem is that the book is a Jasper Springs library book! Wishing for a good juicy mystery, Whiz and Joey decide to go to New York to investigate the scene. When they arrive at Uncle Wilson's home, Whiz takes a look inside the book and discovers a coded message. When he deciphers the message, it says that the countdown has begun and it gives a location, but the shocking part is that the location is in Jasper Springs! Joey and Whiz eagerly return to Jasper Springs and search for suspicious activity and any clues that will help them figure out how to stop the unknown countdown. After days of research and complicated work at the agency's Crime Lab, Joey and Whiz discover two enigmatic clues that reveal the identity of The Case of The Mysterious Countdown. Now it is just a foot, bike, and car race to see who ends up being triumphant. Read the story to see what the countdown is and how it ends. Fred Rexroad nails his third book in the Whiz Tanner Mystery series with a great deal of creative writing. I have read all the books in the series, and this one seems to be the best one yet because it is a tremendously suspicious page turner that reveals a puzzle piece on every page. Whoever reads this book will be dashing through all 192 pages to see what happens at the unpredictably shocking ending. Another thing I like about this book other then the suspense is that it is well explained so readers will not be confused if they have not read other books in the series. Readers will notice that the story goes on like a violent rollercoaster showing not just how Whiz and Joey investigate, but also their relationship and how intelligent they really are. 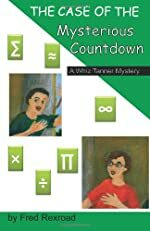 The Case of The Mysterious Countdown is a great story for middle school students because the characters themselves are middle school kids. Unlike other books, The Case of The Mysterious Countdown is a book that is attention-grabbing right from the first chapter which is what makes readers continue reading. After reading this book you might be influenced to read the other books in the series because they are also excellent. Last but not least, this mystery has the most enigmatic and remarkable clues that I have ever read which make this book exceedingly fascinating and out of the ordinary. It is nice to know that writers like Fred Rexroad can make two kid detectives as intelligent as Sherlock Holmes. All in all, The Case of The Mysterious Countdown is a magnificent book that is immensely entertaining and suspenseful. Though the mystery eventually ends, I hope Fred Rexroad and his creative series does not. Review written by Ravi (6th grade student). We would like to thank Fred Rexroad for providing a copy of The Case of the Mysterious Countdown for this review. Have you read The Case of the Mysterious Countdown? How would you rate it?